The Saturday Golf League is a co-ed club located in the greater Phoenix metro area, and is a member of both the Arizona Golf Association (AGA) and the Arizona Women's Golf Association (AWGA). Join us for weekly golf tournaments all around the Valley of the Sun. We offer prizes and lots of fun and excitement. Our members may also apply for a USGA/GHIN handicap through us. Check out The Saturday Golf League links (above) and resources. To receive information about the Saturday Golf League, click here. It only took 7 years-3 months, 283 different HIO players, 327 events, 7274 individual rounds and 31,785 shots on par 3 holes to clean out the “Hole in One” pool of $1,415.00. The shot on the 129 yard #8 hole at the Biltmore Links Course as described by Steve, “I used a 9 iron and dropped it just behind the flag/hole and it spun back. We all watched as it continued to move and then appeared to hit the stick or cup edge. It looked like it wobbled a bit, and then dropped! As you might imagine, high fives ensued and a total disbelief came over me. It was my first ever hole-in-one! It still seems surreal!” Witness to the event was Jeff and Tyler Thursam and Louis Movitz. Steve went on to shoot a smooth even par 71 which included the flight win, low putts, 4 gross skins and 2 CTP’s for a record $ 1,527.00 in credits. Congratulations Steve!!! Jeff Morrissey accepting a special award from Saturday Golf League President Dave Dean for recently getting a “Double Eagle” during an event on 4/29/2017 at the Legacy Golf Resort in Chandler. The framed score card was presented during the season final event awards lunch at the We Ko Pa Golf Club. Scoring a “2” on the par 5 – 490 yard – 18th hole, according to the staff, had never been done. What is more amazing is that Jeff also carded 3 other deuces on the back nine, witness Tom Hegna is quoted “4 – 2’s in seven holes, two birdies an eagle and an albatross, it was crazy!! !” This is the third albatross recorded in the league’s 25 year history with Jim Bieleniewicz getting one last year and Manny Verdugo back in 2005. The Boulders, TPC Champions, Grayhawk Raptor, Verrado Golf Club – the list of top-notch courses booked for the 2016-17 SGL season goes on and on, and this coming season our special, annual “Ringers” event will be conducted over five rounds at Talking Stick Golf Resort’s beautiful South Course. The 2016-17 SGL season begins September 3, 2016 and runs through April 29, 2017. There will be 32 SGL events scheduled during the 2016-2017 season. SGL members earn points weekly for the Tony Albrecht Cup over the course of the season. SGL members who play a minimum of 8 rounds between September 3 and the last Saturday in April 2017 are eligible to play for the 2016-2017 Tony Albrecht Cup and more than $3,000 in prize money. This coming season, players will earn 1 bonus point towards the Tony Albrecht Cup seeding for each round played between September 3, and April 29, 2017, also 1 point for each flight win. Play for the 2016-2017 Tony Albrecht Cup will take place Saturdays on May 6, 13, 20 and 27. Get in position to win prize money and the prestigious Tony Albrecht Cup; play more rounds with the Saturday Golf League! Scoring a “2” on a par 5 is so uncommon that it is nearly impossible to calculate the odds. In any case, long time member Jim Bieleniewicz accomplished the feat on 2/27/2016 at the SGL event at the Starfire Golf Club in Scottsdale. The 479 yard #4 hole on the Hawk course was the opening par 5 of the Hawk to King event on a usual perfect Arizona golf day. Playing partners in the group who witnessed the achievement were Steve Oliva, Bradley Walker and Jeff Morrissey. As described by Jim, after hitting driver off the tee to the left side of the fairway and getting a yardage of 196 to the flag from Morrissey, he faded a 4 iron to the green with a right middle flag position. Not knowing exactly where the ball had ended up, Oliva watched as Jim walked up and looked into the hole, and then Jim looked up and smiled and said “It’s in the Hole”. 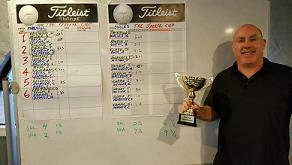 Jim went on to a shoot a 1 over par 71 and finish 1st in his flight. Pictured above is SGL President Dave Dean presenting Jim with the framed score card of his feat. Congratulations Jim! The team of Richard Carroll, Steve Richter and Dave Dean combined to take home the Arizona Golf Association’s 2015 Senior Cup Series. The Senior Cup Series is comprised of 10 events throughout the summer using a four-ball stroke play format to qualify the top 80 of the over 300 competitors for the championship. This year’s championship team of Carroll and Dean accumulated 50 points under Stableford scoring at the Encanterra Country Club to secure the win. This is the second time in the last 4 years that Richard has won the championship, who back in 2012 teamed with Kim Snyder for the title. Starting 9/1/2013 the SGL will start a new membership promotion. For every new player that is brought in by an existing member and becomes a new member, both will receive $25 credit. New members must complete 5 qualifying rounds and establish a SGL handicap index, sponsors name must be declared prior to first qualifying round.